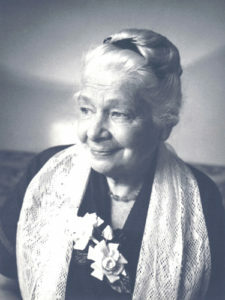 Ida Pauline Rolf – biochemist and the creator of Structural Integration or “Rolfing”. …is a system of body re–education that frees the membraneous layers of the body which can adhere after injury or years of poor body posture. The body compensates over time and muscles tighten and shorten, range of motion decreases, and stiff painful areas make daily activities hard work. As these layers are separated and aligned within the gravitational field, people often experience an increase in energy and an ease of movement that hasn’t been there for perhaps a long time. Sharron studied at the Guild for Structural Integration in order to be able to study with two of Ida Rolf’s students and the original ideas she developed.